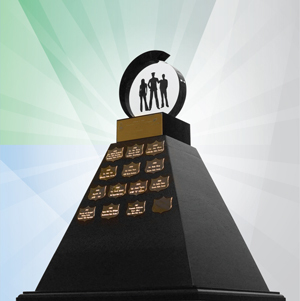 The Minister of Justice National Youth Justice Policing Award was established in 2000 and is presented in collaboration with the Canadian Association of Chiefs of Police (CACP) and the Canadian Police Association (CPA). The award recognizes police officers and others involved in police-led initiatives who, individually or as a team, develop innovative approaches or promising practices that go beyond the formal court system when dealing with youth in conflict with the law. It celebrates innovative policing and serves to inform the police and wider community about creative responses to youth crime. The award is presented yearly each summer. The ceremony alternates between the Canadian Association of Chiefs of Police Annual Conference and the Canadian Police Association Biennial Convention. The winner’s name is inscribed on a trophy, which remains with the winning police service for a year; they also receive a smaller version of the trophy, which is kept by the individual or the team. A Certificate of Recognition is given to all winners. In addition, $10,000 in funding under the Department of Justice Canada’s Youth Justice Fund is presented in the name of the winner to the successful police service or community organization.